We have ON SITE Trailers. with HBO and Premium Cable TV, in room coffee, shower and toilet. Fridge and microwave. Kitchen Set up with cook top or oven use available for an additional fee. 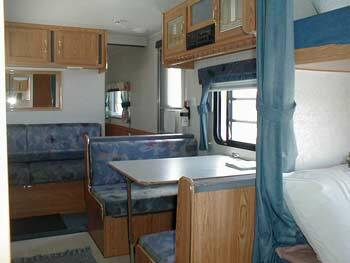 Pictured below is 27 foot, Nomad. Two other trailers available On Site ONLY! Two single bunk beds. One double in bedroom. 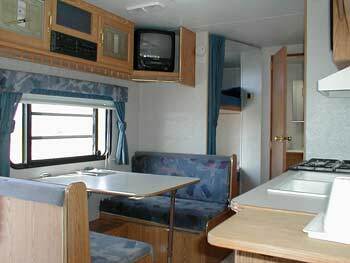 Dinette and couch also convert to beds.